A mysterious island. An abandoned orphanage. 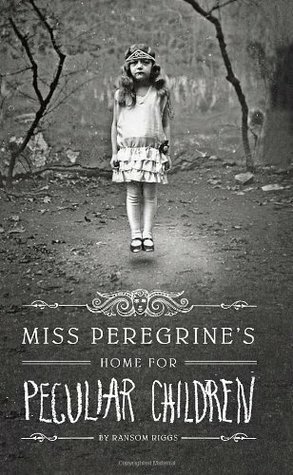 A strange collection of curious photographs.A horrific family tragedy sets sixteen-year-old Jacob journeying to a remote island off the coast of Wales, where he discovers the crumbling ruins of Miss Peregrine’s Home for Peculiar Children. As Jacob explores its abandoned bedrooms and hallways, it becomes clear that the children were more than just peculiar. They may have been dangerous. They may have been quarantined on a deserted island for good reason. And somehow—impossible though it seems—they may still be alive. I know I'm kind of late to the game with this one but better late than never right? I was so excited to read this book and I've had it sitting on my book shelf for months, just taunting me. I am very interested in the weird so I knew this would be a book for me. Jacob is a teenager that is destined to help run his family business one day, whether he likes it or not. When his cooky old grandpa dies in an unusual way and his final words being "find the bird." He sent Jacob on a wild goose chase to find this old bird his grandpa spoke of. It takes him to a small island off the coast of Wales to explore the creepy and seemingly deserted house. He finds much more than he bargained for the children that his grandpa spoke about all his life were still alive and still children. This book is full of odd things and creepy, old looking pictures and I loved every second of it. I didn't see the going back in time aspect coming but it was a nice surprise. There were a lot of things that happened that I didn't see coming and it was like a smack in the face when it did happen. I almost enjoyed seeing the pictures to go along with the story more than the story. It's weird to think these pictures actually exist. I loved this book and cannot wait to read the next one!